TruStage Insurance: TruStage insurance has investment products and programs that are made available by the companies of CUNA Mutual Group. 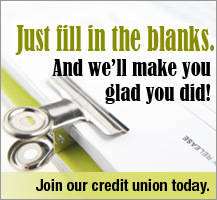 They’re only available to credit union members. That means you could get discounted rates, financial planning products and services that other financial institutions simply don’t make available. Annual Credit Report: Federal law permits consumers to obtain a free report annually from each of the three credit reporting agencies. It is advised that you get a free report from a different agency every four months. Doing so will allow you to monitor your personal online security all year long. Invest in America: Discover companies with exclusive credit union member discounts, and how much you can save when you visit this site. “Don’t Tax My Credit Union”: is a national campaign dedicated to ensuring Congress doesn’t raise taxes on 96 million credit union members nationwide and preserves financial choice for American consumers. My Credit Union: is a website funded by the government that consolidates important information about credit unions, including frequently asked questions, ways to protect your finances, information about debt, and so much more. CU 4 KIDS: CU4Kids is the most comprehensive fundraising vehicle for members of the credit union movement, benefiting our industry's charity of choice, Children's Miracle Network Hospitals®. Visit the website for more information on CU4Kids.